Following on from the success of the 6 Clinical Development Fellows 2013-14, there has been approval for 18 Fellow posts for August 2014. Click here to link to the application site. The Clinical Development Fellow posts are designed for doctors who will have completed Foundation Years 1+2, and want to spend a year experiencing the thrills of Emergency Medicine, with the choice of other highly competitive acute care specialties, as well as the opportunity to complete a Masters in a variety of subject themes, including simulation, clinical skills, or clinical informatics. This has given current Fellows the springboard for successful core specialty training applications in this year's recruitment rounds, and are great opportunities for well-motivated and enthusiastic doctors who want to experience a bit more variety before committing to core or run-through training. Enquiries can also be answered through our contact function on the website. 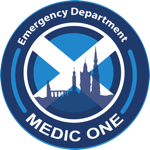 Older PostWhy is Edinburgh EM different?